Fed Says the Economy Is “Strong;” Plans Rate Hike. Wrong but Consistent. The Fed has the worst economic forecasting record of any major institution, with the IMF running a close second. Every year the Fed produces a one-year forward forecast. In 2009, a 2010 economic forecast is produced, and so on through today. If the Fed were off by a few tenths of one-percent, I’d be the first one to congratulate them. That’s not what happens. The realistic range for forecasts is about 8 percentage points, (from +5% to -3%, although more extreme outcomes are possible). Being off by 1 or 2 percentage points means missing the green on approach by 12.5% to 25% of the outcomes. That’s a huge miss and is exactly what the Fed has been doing since 2009 (“green shoots”), 2010 (“recovery summer”) and ever since. 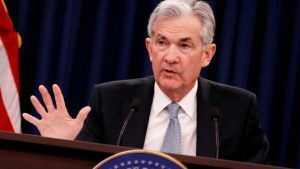 The Fed’s latest forecast, found here, issued last week is that the U.S. economy is “strong” and that the Fed is on track for another rate hike in September as planned. That forecast relies on steady job creation, low unemployment and the predictive power of the Phillips Curve. That’s fine except that “job creation” ignores ten million able-bodied adults who have dropped out of the workforce and are not considered unemployed; “unemployment” ignores forty-year low labor force participation, and the Phillips Curve has not produced statistically reliable forecasts since the 1960s. Meanwhile the Fed ignores the negative impact of trade wars, currency wars, falling ISM services expectations surveys, stagnant wages and a host of other important data. Leave aside the fact that the Fed has never forecast a recession in its 105-year institutional history. What’s unfolding is a slow-motion train-wreck in which weak forecasting and over tightening by the Fed are about to collide with a weak U.S. economy and lead to a recession. The best outcome is that the Fed wakes up to the data by late summer and pauses its rate hikes in September, December or both. The worst outcome is the Fed remains asleep at the switch, keeps tightening, and actually causes the recession they’re preparing to avoid. Let’s hope for the best. But, just in case, an increased allocation from stocks to cash will reduce portfolio volatility and create optionality if the Fed gets this wrong again.